Her career as a cook began in a banquet hall at the age of 16. She worked in the kitchen, preparing desserts and also in the dining room, although she admits that the latter was the hardest due to her shyness. After three years working in her native Galicia, destiny took Martina Cacheiro to Formentera, where she met a cooking teacher who encouraged her to continue with her studies. She didn’t need to think twice about it. 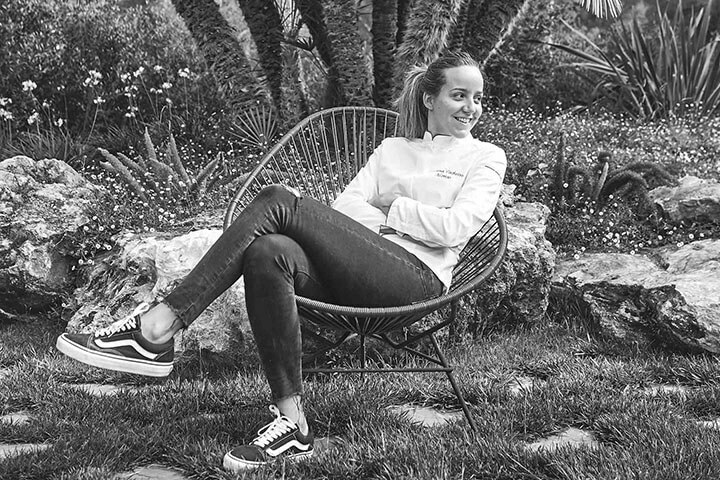 She combined working in Formentera with her studies and after doing her internship in a Michelin star restaurant, her life changed. 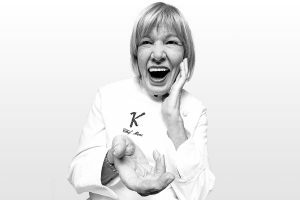 At the age of 23, she was the executive chef at the Hotel Casbah. 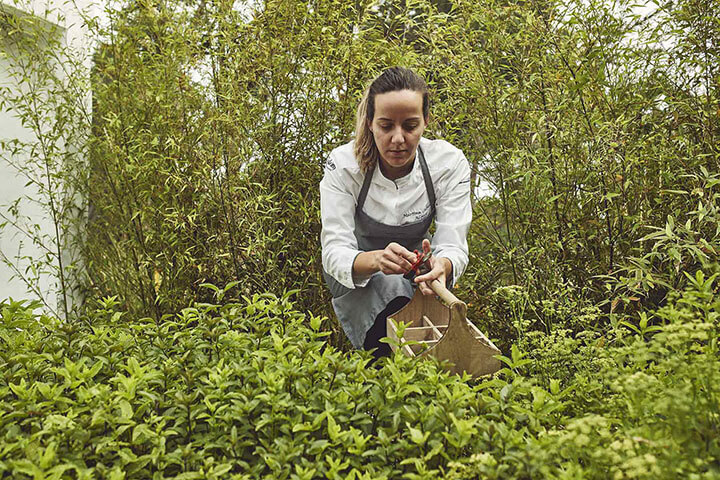 She belongs to the new generation of young women chefs that have arrived raising the stakes high, proving that men are not the only ones good at cooking. Although she admits that it has not been easy, four years later, Martina is very satisfied with what she and her team have achieved. How do you remember your beginnings in the kitchen of the Hotel Casbah? Starting off was hard, because I was only 23 and I was fronting the hotel’s kitchen that had been closed for 15 years, and also it was my first time playing that role… I was a bit scared, but as I am a person that doesn’t give up… I carried on, and here I am. 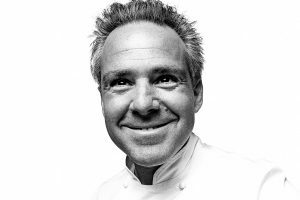 I think we are doing well… Every year we try to continue to learn and improve… Every winter we leave here to experience other things and bring new ideas back to the kitchen. How would you define your cooking? 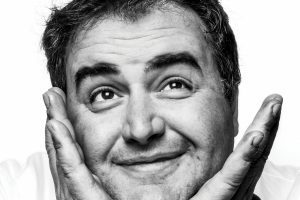 I consider it as traditional cooking: stews, soups, broths… the Galician influence is very present, logically, because it is what I have been accustomed to all my life. Although, it’s also influenced a lot by Formentera… and every year more, I think. I always try to use produce from Formentera when I can, as it is what I have most to hand. We also use modern cooking techniques, such as low temperature cooking… it is a simple way of cooking. I don’t use much seasoning or many spices, because I prefer that when you eat fish it tastes of fish, and when you eat meat it tastes of meat. If you had to define your cooking in one phrase, what would it be? Many people who try my cooking and don’t know me, when they see me, they say: “I knew the cook was a woman, because men don’t have this delicate touch…” (she laughs). Perhaps for this reason we could say that my cooking is feminine… traditional, simple and feminine. What produce of Formentera do you use? I work daily with fish from Formentera: red scorpion fish, four-spot megrim… I also outsource other products, but they come from the Mediterranean: I am working with greater amberjack, people here seem to like it a lot. I also like using the calamari from Formentera, and we cook it with ‘sobrasada’ (raw cured sausage and ground pork with spices), giving a traditional dish from the Balearic Islands a new twist. From my point of view, and according to people who come to the restaurant, our cooking evolves a lot every year. This year you were at the Salon de Gourmets with the Consell de Formentera, the island’s council, as “the standard bearer from Formentera in Madrid”. What was this experience like? 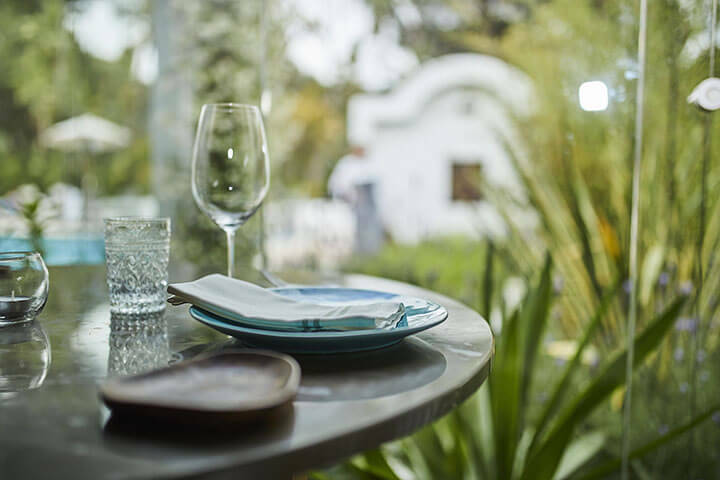 What do you think about the changes that Formentera’s gastronomy is experiencing? I think that it is finally being given some importance and what has been done in the rest of Spain for years is beginning to be seen in Formentera: raising the level of gastronomy. I am inspired by going out to eat at a restaurant. I don’t need much more. In winter when I travel and try new things is how I learn, just like everyone else does. I feel proud of being where I am. Nobody has ever given anything to me, I am very happy and grateful, but I have sought it and worked for it, and I continue to do it and will carry on doing it… always with humbleness: I don’t presume to be a chef; I am the head of the kitchen or the cook, or whatever you want to call it. To be honest I am very happy. What are your hobbies other than cooking? That the restaurant is full, that we do well and that people leave here with a good feeling. And enjoy: I love the service, even though sometimes you are overwhelmed with so many orders, but I like it a lot. Isn’t it curious that there are more women running restaurateur businesses in Formentera than in Ibiza?